When you hit the stage with the Sennheiser EW 300-2 IEM G3, you'll hear better. End result? You'll hit the stage better. 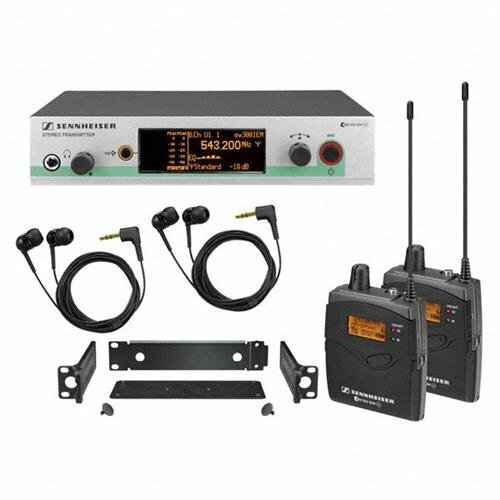 This pro wireless in-ear monitoring Rig offers everything you need for untethered onstage monitoring. The Sennhesier EW 300-2 IEM G3 comes with the SR 300 G3 stereo transmitter, the EK 300 G3 stereo diversity bodypack receiver, and a pair of comfy IE 4 earphones. In fact, the cord on the earphones even acts as a backup antenna, so you know you'll get clear, uninterrupted transmission. Ready to go wireless? Load up with the Sennheiser EW 300-2 IEM G3.